I considered myself a professional plant assassin before my husband and I moved into our first apartment that had a small patch of dirt. For years, I had lived in tiny studios and struggled to keep my plants thriving. So I was overjoyed when our first sunflowers grew at the same time our first baby was born. Lo and behold! It seemed I could actually keep things alive. Just in time for parenthood. Through trial and error, I’ve learned that it doesn’t require a lot of space to grow food at home, just a sunny spot. If you’re lucky enough to have outdoor garden space, the indoors can become a greenhouse to nurture vegetables before planting them outside. Here are some easy ways you too can grow food indoors. Microgreens are a great way to start growing fast, nutritious and fresh food at home that will be ready to harvest in as few as 10 to 15 days. These tiny, immature plants harvested shortly after germination are often seen on the menus of gourmet restaurants and in specialty grocery stores. Microgreens come in a range of colours and flavours, from peppery and spicy like radish and mustard to relatively sweet like cabbage and kale. Their shades of white, pink, red, purple and green make them beautiful to grow. The best part? They’re packed with nutrients. Researchers at the University of Maryland in the US discovered that microgreens have four to 40 times more concentrated nutrients than when they mature. The best way to grow microgreens is in a sunny spot like a north-facing windowsill. Start with about 2.5 centimetres of moist soil, and then sprinkle the seeds on the surface, lightly pat to seat them, and keep them moist until they’re ready to harvest in about a week (depending on the variety). Since they are not fully mature vegetables, they are ready to harvest sooner and don’t require deep soil. Microgreens take up very little space (only the footprint of their seeds), so a sizable harvest can be grown in a tiny container. Here, microgreens are grown in a special under-bench garden with a full-spectrum grow light, a great idea for homes that may not have a sunny windowsill. Harvest your microgreens when the first set of leaves emerge. You can cut them off at soil level, or stop watering for a couple of days, pull them completely from the soil and rinse. They’re a beautiful garnish and a crisp and flavour-packed addition to salads and sandwiches. Wheatgrass is also a type of microgreen that can be grown with little soil or space. Every Easter, the children in my son’s preschool would line their baskets with plastic wrap, a small layer of dirt and a layer of wheatgrass seeds. They would water daily until real ‘Easter grass’ filled their Easter baskets. And when my son was done, our chickens happily ate the wheatgrass, seeds and all. To grow your own wheatgrass, soak seeds overnight. Sprinkle them over potting soil, then lightly press and moisten. Cover the container with newspaper soaked in water so that it is moist and dark for four days; remove the paper once leaves emerge so that they can photosynthesise in the sunlight. After a week, you should have wheatgrass, and you can harvest it for juice or smoothies by cutting off the top two-thirds of the plant. To keep a constant supply, plant four or five pots and rotate, as seen in this mini farm disguised as a table arrangement. Herbs close at hand are a delicious luxury for any home cook. For the same price as a bunch of coriander or basil at the market, you can grow a constant supply of culinary herbs from your kitchen. 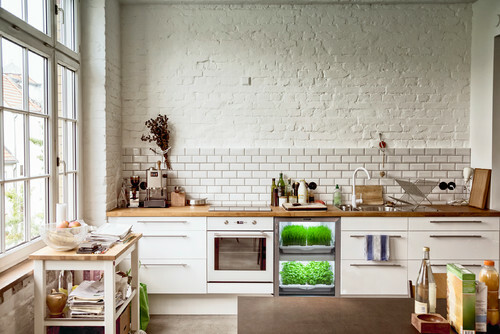 A vertical herb garden is grown indoors and gives cooks the flexibility to remove individual herbs from the wall for cooking or transplanting outdoors. It is also a convenient way to refresh herbs each season. 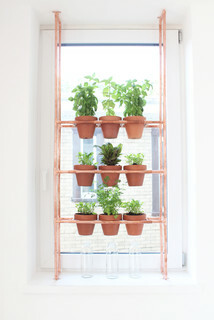 Ben and Jessie Uyeda designed a clever copper herb garden for Ben’s New York City apartment using everyday items from the hardware store. Not only do the herbs benefit from the sun-filled window location, but this copper-pipe garden also creates an elegantly designed privacy screen. Note the multi-tiered drainage that allows water from the plants above to filter to the plants below. Any excess is caught in bottles on the bottom layer so that every drop of water is conserved. Once herbs outgrow their containers, they can be moved into larger containers on a deck or verandah, such as this mini herb garden by Aloe Designs. Having one colour or type of pot unifies the garden and brings the focus to the variety of herb leaves and colours. Mint. It’s perfect for a container indoors since it spreads easily. Basil. Use the smaller globe types for indoor planting. Coriander. It’s short-lived, so plant a succession of two or three plants to keep up a supply for guacamole or cooking. Thyme. This can be divided from a larger plant and planted indoors. Parsley. It doesn’t need much sun but grows slowly. Rosemary. You can take a cutting from a branch tip, strip the lower foliage, and stick it into potting soil (cover with plastic to retain humidity as it roots). Lemongrass. You can use one from the store and start rooting it in water. It has sharp leaves, so I’d recommend transplanting it outside once it’s larger. Chives. They don’t require as much light as other herbs, and the ‘Grolau’ variety was specially bred for growing indoors. Louis XIV prized citrus trees so highly that the Versailles Orangerie was built in 1663 to shelter his collection and to impress royal visitors – before construction on the Palace of Versailles had even begun. You too can grow citrus trees indoors without the space of a French palace or a royal inheritance. Dwarf varieties are ideal for the indoors. Since citrus requires at least eight hours of sun to set fruit and thrive, a north-facing window is your best bet. Citrus thrives in warmth with good soil drainage, so make sure it’s planted in fast-draining soil. Choosing a dwarf variety also makes it easier to reach the fruit. 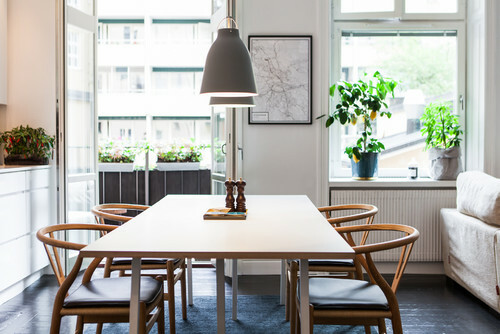 While your tree will not grow to 6 metres tall indoors, that’s actually a benefit. In her book Grow a Little Fruit Tree, Ann Ralph notes, “Well-timed pruning keeps fruit trees small and easy to manage.” Having a smaller tree makes it much easier to maintain and keep healthy. Most citrus trees have sharp thorns, so be sure to place them where there is no traffic. They will need plenty of direct sun with good ventilation to stay healthy. Use a saucer underneath your plant to help catch water runoff and create humidity as the water evaporates, mimicking the perfect growing environment for your tree. If possible, move your plant outdoors during the summer, either on a rooftop or a patio. Tomatoes, capsicums, eggplants and other edibles that require heat for seed germination would benefit from the warmth of being indoors during winter months. While they’re growing, they’ll enjoy the benefits of a greenhouse until the weather is warm enough for transplanting outside. Salad greens also grow well indoors in a sunny spot since they do not have deep roots. By mixing chartreuse leaves of tatsoi and romaine with deep wine colours like red leaf lettuce and mustard, you can create a delicious centrepiece of baby greens for a dinner party. ‘Cut and come again’ lettuce varieties like iceberg, mizuna, rocket, red mustard, pak choi and ‘Red Russian’ kale are great for harvesting the outer leaves while allowing the newer leaves to emerge from the inside. 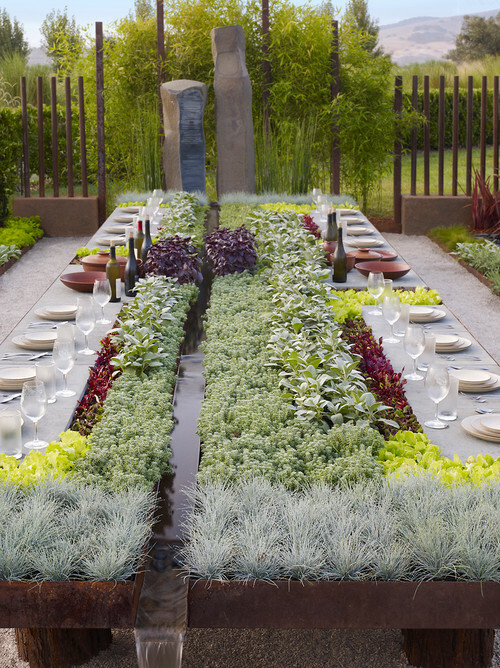 This brilliant table sets the standard for farm-to-table design. Delicious herbs such as sage and lettuce greens are ripe for the picking. In the process of gardening indoors, I learned that I could enjoy beautiful foliage, have a daily visual reminder to water my plants, and create decor that has a positive carbon footprint. These are just a few of the ways to farm indoors and grow food in a small space.